What a journey its been – at once exciting, challenging, visionary, exemplary, full of expectations for the highest levels of corporate governance responsibility, of patriotism and often requiring a tough personality and character. If you were to ask me if I would do it again, I would answer with a resounding yes! 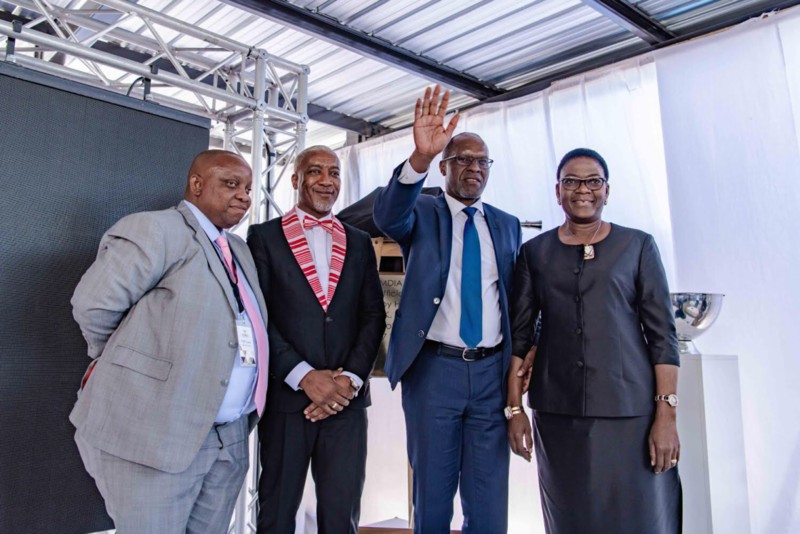 Today – Honourable Minister, Your Excellencies and our esteemed guests, this is indeed a proud day for our company, NAMDIA as we provide you with a privileged inside view of our state-of-the-art new building – EUMBO, which signifies new beginnings. The diamond industry has a history of over 100 years in Namibia since the discovery of the first diamond by Zacharias Lewala whilst working on the railway line to Luderitz in 1905. A diamond rush ensued and towns like Kolmanskuppe became centres of diamond trading in those early periods. With the proclamation of what is known as the “Sperrgebiet” or the “forbidden” zone in 1908 by Consolidated Diamond Mines (CDM), an amalgamation of all diamond miners at the time. 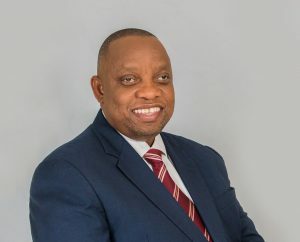 At independence, however, our Government entered into an agreement with De Beers, the owners of CDM, to form a joint-venture company called Namdeb. In terms of this arrangement, GRN and De Beers would be 50:50 joint shareholders in Namdeb. At the time, the diamond industry was governed by the Diamond Industry Protection Proclamation of 1939 which allowed the industry to self-regulate through the Diamond Board of Namibia. This Proclamation of 1939 became defunct at Independence, after a thorough review of the the diamond legislation and regulations, the Diamond Act (Act 13 of 1999) was promulgated in 2000. This Act served as a catalyst for downstream beneficiation in Namibia and paved the way for new entrants into the diamond pipeline. In 2016, a Government Negotiating Team (GNT) negotiated a new Diamond Sorting, Valuing, Sales and Marketing Agreement between the Namibian Government and De Beers through which it was agreed that NAMDIA was to receive (Please note that we buy) a Purchase Entitlement of 15% from the Namibia Diamond Trading Company (which sorts and values the Namdeb production). NAMDIA was established as Namibia’s wholly owned sovereign agency to sell and market our entitlement as per the agreement in the international diamond pipeline and to create a footprint of Namibia’s high quality diamonds in the discerning niche market. The establishment of NAMDIA was thus, a decision taken by GRN to assert its sovereign rights over mineral resources in this manner. The Board of Directors of NAMDIA was appointed by the former Minister of Mines and Energy, Honourable Obeth Kandjoze on 2 August 2016 and consisted of myself, Shakespeare Masiza (chairperson); Ms Tania Hangula (Deputy-Chairperson) and Mr Chris Nghaamwa; Mrs Lorentha Harasses; Mr Bonny Konjore; Mr Venondjo Maharero and Mrs Florentia Amuenje. Mrs Amuenje has since resigned. Subsequently, an Executive Management team has been established who have been dealing with the operations of the company. Mr Kennedy Hamutenya was appointed as Chief Executive Officer. This building we are inaugurating today has a unique story, deeply rooted in the liberation struggle of this country. During the days of the liberation struggle, there stood on this very site, a small white house, often tucked away behind an outgrowth of bushes. And this house served as a centre of refuge and safety for comrades on missions to stand against the apartheid regime or sometimes just as a place to unwind. At the establishment of NAMDIA, the company operated from a small office in one of Windhoek’s malls. When an opportunity presented itself to purchase one of the historic sites of the city, mired in a glorious history, the Board of Directors took a decision to buy this property. And besides the historical importance it also stands as a beacon of our independence as we – as the NAMDIA family – can operate in a safe environment underlined by an ambience where our discerning clients from across the globe can feel comfortable in and call a second business home – pretty much like what they would be used to. This building, characterized has a five-star security rating to ensure the safety of staff and product and as you will witness later during your site visit. Honourable Minister, Honourable Cabinet Ministers, Your Excellencies, Captains of Industry, our peers in the industry, members of the media – welcome to EUMBO, the home of NAMDIA and to its official inauguration.